How does literature get “translated” into film? What makes a zebrafish retina grow? How do music and videos affect creative problem solving? 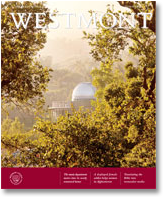 Student researchers posted answers to these and other questions at Westmont’s first annual Student Research Symposium in April. The 29 students presenting summaries of their independent research projects included Timothy Chew, a senior natural science major who worked with a local fire marshall to design hydraulically calculated fire sprinkler systems for the residence halls. History major Kathleen Le Pley conducted a case study in Polish nationalism. Two physics majors, Jennifer Wilkes and Bill Klug, looked for practical applications of superconductors in wireless communications. The Faculty Research Committee sponsored the symposium organized by physics professor Dr. Warren Rogers. Disciplines represented were: psychology, English, natural science, chemistry, philosophy, history, anthropology, economics and business, physics, mathematics, and biology. 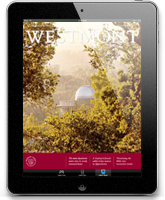 The opportunity for undergraduates to conduct significant research projects distinguishes Westmont’s academic program. Students work directly with faculty and present their results at meetings of professional societies and in articles published in scholarly journals.